Visiting the landing beaches the first week of June, around the anniversary of D-Day, is always special! Every year, it is a time of celebration and remembrance. Today I was with a group of american guests at the Normandy American Cemetery above Omaha Beach. Following the official ceremony, we organised a more private ceremony and laid a wreath at the grave of Private Roy U. Talhelm. Roy Talhelm is the youngest american soldier buried in Normandy. He was from Baltimore, Maryland. After a difficult childhood he went to work at a very young age in construction. In 1942, at aged 15, he falsified his birth certificate to join the army. He volunteered to become a paratrooper and joined the 506th Parachute Infantry Regiment of the 101st Airborne. While in training, he had a daughter with his girlfriend, Donna. He only got to see her once, in 1943, just before shipping for England. On D-Day, he jumped over Normandy. Two days later, on the 8th, he was wounded while defending the bridge of La Barquette north-east of Carentan. He died from his wounds four days later. 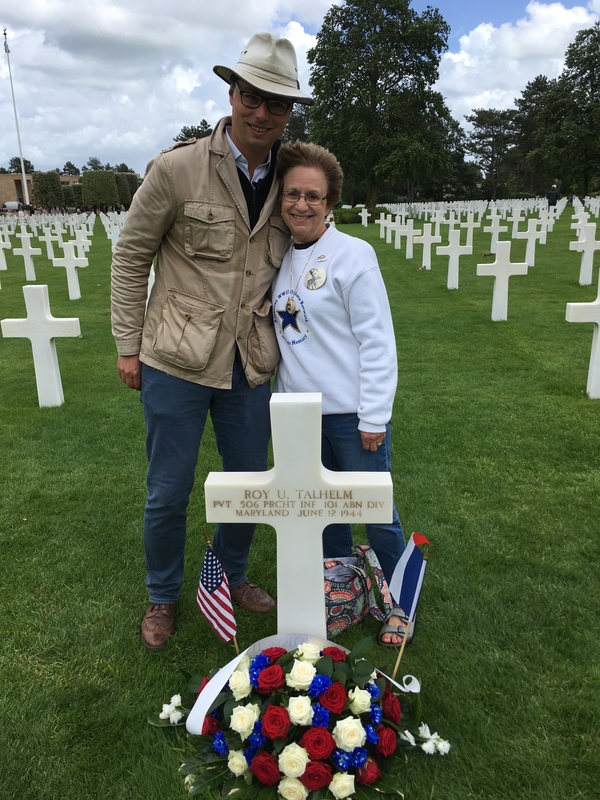 Just as I had just finished telling his story and as we laid the wreath with my guests, a staff member of the ABMC (American Battle Monument Commission, in charge of maintaining the cemetery) came up to me to tell me Roy’s daughter was there… Donna Talhelm Allen. She had patiently waited while we were laying the wreath and then came up to us. She seemed very touched to find us on the grave of her father. Donna was kind enough to tell me a little more about her father. She is very involved in the American WWII Orphan Network. If you come to Normandy around the anniversary of D-Day, expect the unexpected!